This is one of the very important ekadashis of the year and has great importance within itself. On this very day, Lord Vishnu wakes up from his divine sleep after a sleeping period of 4 months of Chaturmasya. For these four months, he acts as a gatekeeper for his dear devotee Bali maharaja at Sutalaloka who gave up everything even himself in charity when Lord Krishna took the Vamana incarnation despite being warned by his spiritual preceptor Shukracharya. When he won Lord’s heart, the lord asked him for a benediction to which he refused. In return to his devotee’s selfless devotion, the lord awarded himself to him. The people who desire liberation from this material entanglement and wish to develop devotion to Lord Hari keep ekadashi. One must rise up early in the morning and must take a full bath in fresh water. One must put on clean clothes and put a tilak on his forehead. One must worship Lord Krishna by chanting his holy names. One must not eat grains the whole day and must try to fast completely even without water till noon. One must break his fast the next morning after 1 hour of sunrise. In the evening, one must gather the relatives and must decorate the house with a mixture of geru and multani mitti by drawing forms of Lord Narayan. One must light a ghee lamp before Narayana and offer him Singhada (Water chestnut), Sugarcane and other eatables. One must sing his glories keeping awake throughout the night. This entry was posted in Puja and tagged celebration, Deva uthani, Deva utthana ekadashi, ekadashi, Gyaras, Lord Krishna, Lord Vishnu, Shubh, Shubh karya, Shubh puja, shubhpuja, shubhpuja.com. Chhat puja is the main festival of the people living in Bihar, the state lying in the North East of India. Also known as Surya shashthi, it is one of the great festivals which is offered as veneration to Suryadeva, the sun demigod. 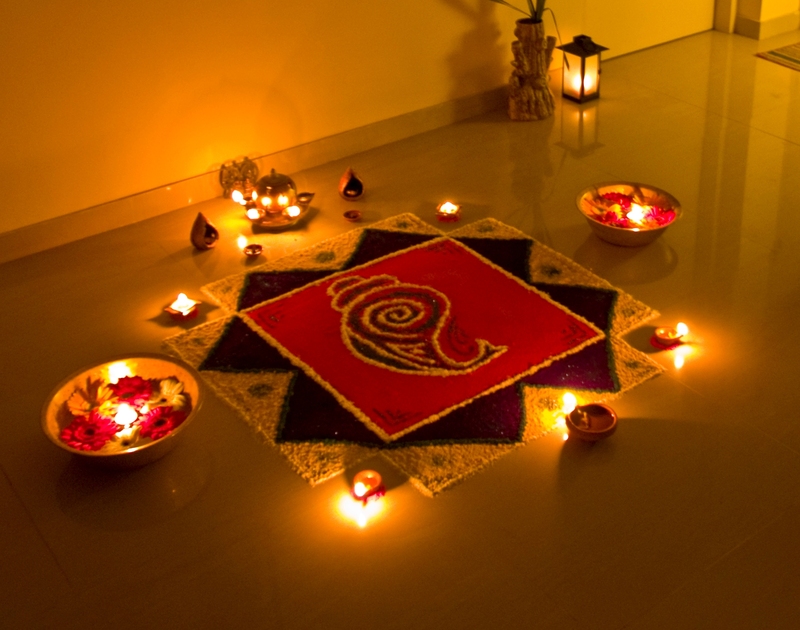 It is a festival of the Hindu religion dedicated to the God of energy, also known as Dala Chhath or Surya Shashti. People corroborate this festival to offer thanks to the Lord Surya for blessing the life on the earth. 1st day : The people take bathe in early morning in the holy water of Ganges and bring some water to their home for the offerings. The home and its surroundings must be nicely cleaned this day. They take only one meal a day known as kaddu-bhat. 2nd day : The devotees keeps fast for whole day and break their fast in the evening after sunset after the worship of Sun. They offer kheer, puris, fruits in the puja. After taking meal in the evening, they go on a fast without water for the next 36 hours. On the third day (day of Chhath) they offer the Sanjhiya Arghya at the ghat of riverbank. 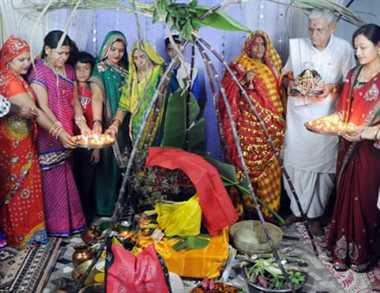 After Arghya, they wear the single saree of turmeric color. . At the night of Chhath a vibrant event of Kosi is celebrated by lighting the lamps of clay diyas under the covering of five sugarcane sticks. The five sugarcane sticks indicate the Panchatattva (earth, water, fire, air and space) that human body made of Panchatattva. On the early morning of the fourth day (Paarun), devotees along with their family and friends offer Bihaniya Aragh at the ghat of riverbank of Gange. 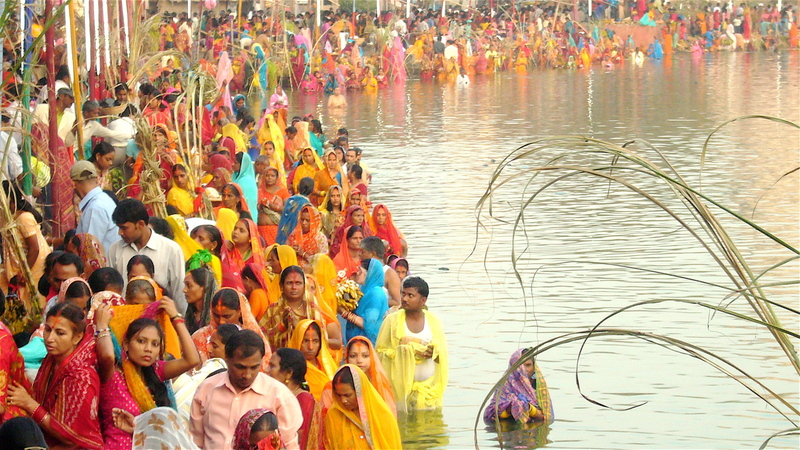 Devotees end their festival through breaking the fast by having the Chhath prasadam. This entry was posted in Puja and tagged bihar, celebration, Fest, Festival, festivals, festive, festivity, Science, Shubh, Shubh karya, shubhpuja, shubhpuja.com, sun God, Surya, Suryadev.